This visit to Front Sight was much better than my previous visit, because this time I arrived with a better mind-set. My mindset prior to my first visit to Front Sight was colored by a combat hand-gunning class from Chuck Taylor's American Small Arms Academy many years before. Taylor was a bit of a demi-god back then — a guy who tested the efficacy of bullet-proof vests by putting them on and having someone shoot him in the chest from a few feet away. The stuff of legend, Taylor was rumored to have been in several actual gun fights, emerging the winner in each one. Back then, modern combat hand-gunning was more or less in its infancy, and as one of its most credible proponents, if Taylor said something, that was considered to be the way it was. Jeff Cooper was probably better known, but Taylor had “street cred” that couldn’t be equalled. Before discovering Front Sight, I'd had a couple of decades to internalize Taylor's teachings, and figured that having been to the mountain, so to speak, I was in a position to judge the way others taught handgun technique. Thus, when I attended my first Front Sight course (a two-day class on defensive hand-gunning), I had my guard up against having anyone tell me that anything I was doing was incorrect. It was fine if they wanted to help polish my technique, but I arrived determined to reject any substantive changes. I still learned some things, but not being mentally prepared to learn really hampered my progress. "You’re not shooting to take a life, you’re shooting to save a life." This time, I returned to Front Sight with a different state of mind. I knew that any day I'd be receiving a call to take a California firearms safety course, and I absolutely wanted to nail the shooting portion of the test. I arrived at Front Sight a sponge for information, hoping that four days at Front Sight would polish anything that was already correct in my existing technique, and cement any new information and/or techniques in place of ones I needed to discard. Another thing that helped was using a 9mm Glock in place of the 9mm Springfield XD I'd used the first time around. The Springfield XD isn’t a bad weapon, but it seemed more cumbersome to operate than what I observed with the students using Glocks. Toward the end of the second day on my first visit, one of the Front Sight instructors allowed me to try his Glock 17. I don’t know if it was stock or tuned within an inch of its life, and frankly at that point I had no idea what one might do to a Glock (or XD, for that matter) to optimize the trigger pull, but his weapon shot so much better than the XD I made the decision to use a Glock the next time I visited Front Sight. Having shot a number of Glocks, I recommend the Glock 19. It’s a great-shooting gun, and while it’s small enough to be concealable, it’s large enough for day-to-day range use, local competitions, and self defense. If you want to get fancy, buy one of the extended mag releases for use at Front Sight and competition, and save the standard-length one for concealment, if you have a problem with clearance (it’s easy to switch between the two). Whichever gun you decide to take to Front Sight, make certain that it doesn't have any sharp edges that can cut you or shred your holster. Modern guns such as the Glock have become much better in this regard, but if you're a fan of the 1911, seriously consider having it "de-horned" by a gunsmith if necessary. Given the current ammo shortage, it would have been an expensive proposition to use factory ammo for the 600 rounds required for the four-day course. Fortunately, Front Sight recognizes this new reality and has changed its policy to allow factory reloads. At the same time, I discovered factory reloads from LAX Ammo. I knew it could be disastrous to show up for class with poor-quality ammo of any type, but I took a chance and it paid off. While several of the other students, each of whom was using factory ammo, suffered some kind of ammo-related malfunction, I had none whatsoever. If you’re going to be attending a class at Front Sight, I would recommend taking something really simple to run, such as a Glock, five magazines (one for the gun, four in your mag pouches), a good Kydex holster (start with one by Uncle Mike’s — cheap, durable, and serviceable — or go with the best and get one from Raven Concealment — no relation), and magazine pouches for four magazines (you start the course with your magazines in your magazine carrier, not in the gun). Front Sight does not allow pocket pistols, so the smallest handgun you should consider is along the lines of the Glock 26. You also need to be aware that Front Sight does not allow the popular Blackhawk Serpa holsters. You’ll need shooting glasses (of course), but Front Sight also considers a hat to be part of your eye protection, as the brim of the hat will help keep hot brass from the person next to you on the line from lodging between your eyeball and your glasses. This is a wise policy, and you’ll be in the desert where you absolutely will want to have a hat anyway. I wore my ancient Ray-Ban shooting glasses and nobody said anything to me about it, but Front Sight now prefers that you bring glasses that have side shields, presumably as further protection against flying brass. If like me you have the older-style shooting glasses without built-in side shields, you can buy snap-in side shields from various suppliers starting at around a buck. "You carry a gun because a policeman is too heavy." You’ll also need electronic ear protection. It’s more expensive than passive plugs, but it will allow you to hear the range commands while protecting you when shooting. Note that you can get (expensive) inside-the-ear hearing protection, but unless you already have it, get the over-the-ear style, which is visible at a glance by the instructors who will be monitoring whether or not you have your hearing protection on. The over-the-ear hearing protectors will also help hold your hat on if it gets windy. If you are going to be shooting a semi-auto pistol, your gun probably came with a magazine loading accessory to make it easier to reload. These are highly recommended, and although you can get by with the one that came with your gun, the hot ticket is the Maglula UpLULA. Obviously you’ll need to check the weather forecast for the Pahrump area for the time you’ll be visiting, and take clothes that allow you to dress appropriately, but give special consideration to your outer shirt and (for four-day course students) the concealment garment you’ll be wearing on days three and four. The outer shirts you choose should fit fairly snugly against your body. If your shirt is too loose, or if the bottom isn’t long enough fully to tuck into the top of your pants, you will find yourself trying to tuck your shirt into your holster along with your gun, and putting a magazine back into a magazine pouch that’s wrapped up in your shirt is a real adventure. For the concealment garment, anything that’s too light will be difficult to sweep out of the way, and open-front garments are easier than closed-front garments such as sweaters. Front Sight teaches how to present from concealment using either type, though. If you don't already own something suitable, there is a number of companies making concealment vests for IDPA shooters. Empty magazines go into your pocket, or onto the ground in an emergency reload — not into your magazine pouch. For this reason, you might consider shorts and/or pants with cargo pockets on the legs. If you like that "tactical" look, 5.11 Tactical has a few choices; if you like something more subtle, check out Dickies. Other than that, read the information (FAQ) for the course(s) you take, take a small-to-medium canteen (Front Sight provides plenty of water), and prepare to have the time of your life. I stayed in one of the new cottages at the Wine Ridge RV Resort, and although space was a bit tight in the cottage, the ambience was much better than Saddle West, where I've stayed before. It doesn’t hurt that the best restaurant in town is walking distance from the cottages. It’s only a 25-minute drive from the cottages to Front Sight. Because our cottage had a full kitchen, I took enough food for my breakfasts, lunches, and dinners for the duration. If you’re not into doing that much prep, you can order a box lunch to be awaiting you each day from Beach Cafe. Saddle West had a similar boxed lunch you could take with you, if you stay there. Cell phone coverage at Front Sight is spotty, but you can sign up for optional wi-fi if you need to stay in contact when you’re not in class. Front Sight does not allow video recording of classes, but you may take still photos. I promised myself I'd take a bunch of photos this visit, but — again — didn't have time. Front Sight keeps you busy. As for the course itself, this is how I remember it. Keep in mind that my memory may be faulty, and that Front Sight may change up its training practices and schedule by the time you get there. Leave bulky items in the car (range bag, cooler, etc.). Have your driver’s license with you. Have your handgun, unloaded with no magazine in the gun. Have a sturdy belt, holster, and magazine (or speed loader) pouches. The easiest way to do this is to wear the belt, holster, and magazine pouches, put your gun in the holster and the (empty) magazines in the mag pouches. One box of the ammunition you are going to be using in the course. As with all good shooting ranges, Front Sight is in the middle of nowhere, "nowhere" being in southern Nevada in the Mojave Desert between Pahrump and Las Vegas, in a beautiful, open valley. Much of the Mojave is classified as "high desert," because the altitude hovers around 3,000 feet. If you are not from a desert area, you should be aware that there is a reason deserts are so-named. Temperatures can be extreme, as can winds, humidity, and rainfall. Preparation includes both bringing what you'll need, and having the proper mind-set. Despite the gorgeous desert and mountain views, you're definitely not in Kansas anymore. The gates open at 6:30 the first morning, a little earlier than other days, to allow ample time to check in. The inclination is to arrive at 6:00, wait for the gates to open, and then rush to check-in and weapons inspection, but there's always plenty of time; there's no need to obsess about being first in line. Once the gates open you drive to the parking area closest to the classroom. Along the way, there's a large tent-like building on the left. This is for special instruction, such as concealed carry permit classes. The main classroom is ahead on the right. After you park, get your gun(s), ammunition, belt, holster, and magazine pouches, head over to the conex to check in, and then proceed to weapons inspection. Front Sight has been doing this for awhile, so neither takes very long, and they have staff on hand to help guide you through the process. The reason you don't grab all your gear is that next you are headed over to the classroom — a huge building with a free-span roof — and grab a seat. The long rows of tables are a bit close together for my form factor, so I like to arrive early to pick my spot. If you're not as picky and don't feel like simply sitting, you can grab a breakfast burrito from the conex outside the classroom, check out the pro shop, visit the gunsmith, buy ammo from the Stockpile Defense conex, or cruise the shooting bays on range one until lecture time. Brad Ackman has been with Front Sight seemingly forever, so it was an honor and a privilege to have him welcome our class to Front Sight. Brad went over safety issues and the importance of firearms training, and covered the documents that we needed to sign and date before proceeding. Part of the Front Sight teaching method is to repeat key points over and over, and so it was from the start, as one of the documents concerned the dry practice protocol. Next up was a lecture on the five levels of competence, and then a lecture on handgun "stopping power." The range officer for this visit was Paul Beneux, who characterized working at Front Sight as the best job he's ever had. As with the instructor’s procedure during my first visit, Beneux worked from the standard curriculum (which I believe is done both to ensure that nothing is left out, and to coordinate automatically with other classes on other ranges, so that all classes are getting verbal instruction at the same time, which then means that all classes are also shooting at the same time). Paul was ably assisted by Rena Tucker and Chris Dickson. The mix of personalities of the instructors really worked well. Beneux gave the impression of being the dogged taskmaster who was going to get each of us across the “finish line” even if he had to drag us, but with a presentation leavened with a fun and appropriate sense of humor. Tucker was a bundle of energy and tremendously outgoing; infectiously enthusiastic. Dickson was the young disciple; still learning but already competent. Beneux had one recommendation for right-handers that I found interesting but did not follow myself: Thread your belt through your belt-loops "backwards." This puts the belt buckle to the right of your centerline, on the same side as your holster. This way, when you undo your belt, your holstered gun won't fall because the belt buckle is there to stop the end of the belt from getting past the first belt-loop. Don’t load the gun until you need to use it. Know how to operate your gun properly. Store your gun safely and securely to prevent unauthorized use. Front Sight strictly enforces its four firearm safety rules. As with all rigid sets of rules, you might wonder if they really mean what they say. For example, if you really treat your weapon as if it is loaded at all times, you could never perform a dry practice drill anyplace but a shooting range or the middle of nowhere. There are also some guns that require you to trip the trigger before disassembly, which would be much more difficult if you were treating the gun as if it is loaded. My version of Rule 1 is: "Treat every weapon as if it is loaded each time you pick it up. If the gun leaves your hand after you verify it is unloaded, you must re-verify that it is unloaded the next time you pick it up." Not as catchy, but for me, functional. The NRA rules seem better in this regard, but even they fall down on the rule about when to load the gun. Does this mean you should carry around an unloaded weapon, loading it only after being confronted? Sounds like a good way to finish a shoot-out in second place. One good thing about the Front Sight safety rules is that you have to break two of the rules before you put yourself in danger of a negligent discharge, which provides an extra margin of safety. After firearms safety comes range safety. Front Sight has worked out some great techniques to help ensure a safe yet efficient firing line, and they start with dividing each class into two equal relays, pairing each member of one relay with a member of the other relay. While one relay is on the firing line, the other relay stands close behind, each member monitoring his counterpart on the other shift. Partners are not just onlookers, though, as Front Sight has a complete set of verbal and physical responses to various range safety violations. At first, preventing and correcting these violations absorbs a lot of the attention of the shift members who are monitors, but after the second day, things are usually running smoothly enough that partners can help those on the firing line with procedural issues, reinforcing proper weapon handling techniques, and calling shots on target. Along with the range safety techniques come the various range commands. Each of the commands is necessary, but combined with all the terminology and other information that might be new to the shooter, it can seem overwhelming. Fortunately, the range commands are issued in almost the same order for most of each course, so you will have plenty of opportunities to get into the Front Sight rhythm. Still, you want to pay attention so as not to become one of those students who gets so excited about having mastered one troublesome aspect of shooting that he rushes through the drill ahead of the range officer. One of the Front Sight techniques that I liked from the get-go is their chamber check/magazine check protocol. Back in the days of Chuck Taylor, you’d pinch-check your .45 auto, but given that many people aren’t using a 1911 these days and those who are may be using one with a full-length guide rod that makes the pinch-check impossible, Front Sight’s chamber check/magazine check protocol works on all automatics (they have protocols for revolvers, too, if that’s what you use). You can always tell at the range or at competition shooting events who the Front Sight graduates are by their chamber check/magazine check regimen. One benefit to Front Sight — with thousands of students each year — is that it’s less likely to have a student blow the end off of his support-hand index finger because of a fumbled pinch check. Weapon in close to the body. Move trigger finger away from slide. Grasp slide, move back ½ inch to allow view into chamber. Pull the slide forward into battery when done. Move hand around if necessary to get thumb onto mag release. Hold the front of the slide with the support hand to facilitate this. Release mag; index the magazine with your finger as it comes out so it sits in your hand in the proper orientation for re-insertion. If no magazine, insert finger or thumb into mag well to verify it's empty. On guns with a safety, do all operations on the slide before starting operations on the frame. You may be wondering: Why go through all this rigamarole when you can just look at the "loaded chamber indicator" on some handguns and tell if the gun is loaded or not? The answer is that when you depend on the load chamber indicator, you are depending on a mechanic part that can malfunction and give you bad information. Also, some handguns have a "peek-a-boo" feature that let you see if there is a round in the magazine, but this only works when you can actually see. A variation of Front Sight's chamber-check technique affords the ability to chamber-check your weapon even in the dark. Once you have ingrained the chamber check/magazine check routine, you can verify the condition of your weapon at any time quickly and easily. And you do ingrain it quickly, because next up Front Sight teaches you how to load and unload your weapon, and the loading and unloading procedures each begin and end with a chamber check/magazine check. Always. Front Sight doesn’t say anything about this, but I feel that these seemingly redundant procedures help you to become more familiar with running your gun. The more comfortable and fluent you are with your weapon, the safer you will be, and although you always want to be safe with your weapon, you definitely need to be safe when you have 40+ other people close by. The Front Sight method of handling a magazine is to hold it so that the index finger of the support hand touches the tip of the top bullet (or the top of the empty magazine). This is the first of the magazine "indexing" moves, and is the most important. When you grab a new magazine from your mag pouch, Front Sight teaches you to wrap your hand around the mag pouch in such a way that when the magazine comes out of the mag pouch, your finger will already be in position to "index" it to your hand. To insert the magazine, index the back of the magazine on the back of the magazine well with the bottom of the magazine canted slightly “back” from the angle of the mag well. Push slightly forward and up smartly on the bottom of the magazine to seat it. Rack the slide backward with your support-side hand, releasing it at the rearmost extent of its travel. Do not keep your hand on the slide, and don't "ride the slide" as it moves back into position. Allow your hand to touch your shoulder after releasing the slide at the end of its travel. Similarly, when unloading, you grab the magazine as it drops from the mag well in such a way that your index finger will be in position to touch the top round / top of the empty magazine as it drops into your support hand. Hold the gun 90 degrees on the side (ejection port facing the ground) when racking the slide to unload the chamber. Off-side hand straight back, and then across the chest and down to your pocket with the unloaded round, to prevent muzzling yourself during the unload. Grip the gun as high on the frame as you can to enhance control. Firing hand thumb high and relaxed. Support hand, second knuckle beneath the trigger guard. Fingers on fingers, thumbs on thumbs. Support-side foot a few inches ahead of your strong-side foot. Body angled ("bladed") slightly relative to your target, feet pointing straight forward from the body (that is, not toward the target). Support arm bent at the elbow, elbow pointed down. Raise your weapon to your line of sight; don't lower your head to align with your weapon. If you are stuck with the isosceles stance, Front Sight will train you without making you change to the Weaver, and you may stand anywhere on the firing line, but I would recommend you try to stand at the extreme left end anytime you can (if you are right-handed; lefties should stand at the extreme right end of the line when possible). The reason is that your relay partner stands behind you watching (“coaching”) for safety violations and helping with form and procedure. If you are in a Weaver stance, your coach can better see what you are doing. If you are squared off to the target in the isosceles stance, your coach won’t be able to see what you’re doing with your support hand, and sometimes it will difficult for him to monitor how you are controlling your muzzle. In an isosceles stance you are more easily able to muzzle the person next to you (during a reload, for example) than if you are in the Weaver stance. It’s not a huge thing, but it is something to be aware of. A couple of the students used slight variations of grips and unless they were shooting poorly, the instructors let them to continue, still with the admonishment to at least try it the Front Sight way. At this point in the course, you’ve got your gun out of your holster, checked its condition, loaded it, are holding it correctly and facing in toward the target. Front Sight then shares the three secrets of marksmanship, and you learn the reason why it adopted the name Front Sight. Front Sight also helps you determine which of your eyes is the dominant one, to aid your hard focus on the front sight. Front Sight also recommends that you close your non-dominant eye, as opposed to leaving it open or semi-open. If I remember correctly, this is when you start shooting, as the instructors help each student one at a time with sight alignment, sight picture, and trigger control. As mentioned above, they soon get you thinking about combining these three skills into one. Something that intrigued me in the first few hours of the course was that Front Sight seemed to have fine-tuned the presentation since my first visit. Note that the first two days of the four-day course are virtually identical to the two-day course, so that wasn’t the reason for the differences. Keep in mind that during my first visit I was determined to resist anything that I felt would not have been Taylor-approved, so I might have misremembered the order of things, but the way I recall it, Front Sight used to teach proper presentation (AKA, “the draw”) much earlier in the course. I also don’t remember the emphasis on trigger reset that Beneux tried to instill in us. Finger on the trigger at the center of the first pad at the end of your finger. Take out the slack in the trigger. Build pressure until the trigger “breaks.” This should be a surprise; don't force the break. Hold the trigger back until the gun settles. Release the trigger just to the reset point. Taking advantage of trigger reset can be a huge factor in faster, more accurate shooting, but it has typically been treated as an advanced technique. Be that as it may, Beneux had the students shooting (and at least vaguely aware of the trigger reset) well before nailing down the five steps to present the weapon from the holster. This is not to say that people were dragging their weapons out willy-nilly — Beneux pre-shadowed the presentation steps during the early shooting sessions. I found the non-linear order of instruction very effective in this case. As for the trigger reset, taking advantage of this aspect of the trigger mechanism allows for faster, more accurate follow-up shots, especially with striker-fired weapons such as the Springfield XD, Smith & Wesson M&P, Ruger SR, and Glock. I'd tried it on my own at the range, but without understanding the sequence of events had not figured out how to make it work in the real world, let alone mastered it. For new shooters (and there were plenty new shooters at both the two-day and four-day courses I took), it’s great to learn the correct technique right off the bat. For old stick-in-the-muds such as myself, having this technique introduced early on gave me enough time to begin to ditch my old habits and acquire the correct new one(s). Another benefit of the Front Sight approach to trigger reset is that it dovetails with Front Sight’s other techniques such as the proper sequence for a controlled pair of shots to the torso, and the designated head shot protocol. Unfortunately, given my ingrained bad habits, I didn’t synthesize this for myself until the afternoon of the fourth day. One technique that Front Sight does not teach in this class is the safe way of handing a weapon to someone else. At Front Sight, virtually all weapons transfers go through an instructor, so perhaps this isn't high on their list of things to teach, but out in the real world it's nice to know. My favorite method is for the person transferring the gun to hold it by the top of the slide (or frame, for revolver shooters), with the muzzle pointing down. This allows complete control of the direction in which the gun is pointing, and leaves the grip unobstructed. The person receiving the gun is then able to take the gun by the grip — keeping his finger off of the trigger, of course — at which time he should (in my opinion) check to verify whether or not the gun is loaded. As for what Front Sight does teach on the first day, it’s a lot to absorb before lunch, but amazingly, even the beginners seem to get it. Lunch can be eaten in the classroom, which has plenty of seating and climate control, or you can take your lunch back to the range. While you are eating, Front Sight has a DVD presentation you can watch. After lunch, there is a classroom lecture on different levels of awareness, and how to avoid trouble by being more aware of your surroundings. The lecture also includes a discussion of the “combat mindset,” the development of which may be key to helping you avoid a confrontation in first place, or survive an unavoidable confrontation. Back on the range, Beneux introduced Front Sight's five-step presentation of the weapon from the holster. Before lunch, when removing the weapon from the holster, Beneux had stepped the students through commands to get them doing it a certain way. In the presentation section of the course, he amplified and augmented his previous commands into a unified whole. Knowing the steps and doing the steps are two different things, of course, but the presentation is one of those things you can easily dry practice for ten or 15 minutes a day until you master it, once you know the proper technique. Dry practice makes use of an unloaded weapon in a controlled environment (no ammunition, no distractions, no possibility of a negligent discharge) to duplicate a technique slowly and methodically until you can perform it quickly and smoothly. Some pistol manufacturers discourage dry practice. If you have concerns about your pistol, check with the manufacturer, especially if you are using a 1911 variant. Because Front Sight teaches defensive handgun (as opposed to bullseye, recreational, or competition shooting), after you’ve engaged your target, it’s time to move in case the fight isn’t yet over. The movement is called the after-action drill. At Chuck Taylor’s course, the after-action drill involved a lot of movement, but the class sizes were much smaller. At Front Sight, the after-action drill is typically one step off-line (to the right or left of your previous shooting position), while checking your surroundings for other threats, checking that your target is down, and checking that your gun is still in running condition. The Front Sight presentation to the target is used in firing drills, and — of course — when you find yourself in a bad situation and need to get your weapon into the fight immediately. Support-side hand to the midsection in an explosive movement — the faster the better. Firing-side hand forced/driven down onto the gun. Firing grip attained. Pull gun up until the gun clears the holster. Keep your finger off the trigger. Move the gun straight forward, pushing out toward the target. When the gun is away from your body, move your support hand to the gun, acquiring the proper grip. Safety off, finger on the trigger. Press out. As soon as you see the front sight in your peripheral vision, move your focus to it. If you're like most shooters, the two most popular errors occur during Step 4. One is "bowling" with the gun, which means that from Step 3 you let the gun drop and then loop it back up into your shooting position instead of pushing straight out toward the target from the close-contact position. The other is the "Lone Ranger" presentation (not Front Sight's terminology), where you point the muzzle up to the sky during Step 4, and then bring it down to the target. Front Sight's presentation to the ready is used in dry practice drills. In the real world, you'll probably use it most often to unholster your weapon before putting it away in the safe, but iit can be used if you anticipate trouble and are prevented from escape, but still have to time to prepare for the worst. When Front Sight says "finger off the trigger," they don't mean to lay your finger alongside the trigger on the trigger guard. They want your trigger finger up on the slide. This is probably safer, with the bonus that it's a lot easier for observers to see that your finger really is off the trigger. In fact, you can see if someone on the line has his finger alongside the trigger guard from the support side as well as from the strong side. Move the gun forward. When the gun is away from your body, move your support hand to the gun, acquiring the proper grip. Safety off. Press out at a 45 degree downward angle. Finger off the trigger. If you learned combat handgunning back before the continents began to separate, as I did, you'll note a difference in the Front Sight method from the way we used to do it: When the safety comes off. In the olden days, presentation to the ready meant you had your thumb atop the safety (you were using a .45 caliber Colt 1911, right? ), and your finger off the trigger. You wouldn't lower the safety until you pointed in from the ready position, at which time your finger also went to the trigger. Going back to the ready position meant taking your finger off the trigger and re-engaging the safety, after which time you'd move your thumb back atop the safety. One technique I held over from my first trip to Front Sight was always to present your weapon as if you mean it. That is, when you're finished at the range don't just drag your gun out of the holster any old way; present to the ready the way you've been taught. This advice seems especially good for those who are carrying concealed, not only because presenting from concealment is something that cries out for additional practice, but also because the vast majority of the time you will be presenting from concealment in order to put away your weapon for the evening. Over the course of a year, you may not set aside much time to practice presentation from concealment, but you will have 365 opportunities to hone your presentation skills. Front Sight does not teach stepping off-line during the presentation of your weapon. I neglected to ask why. There are those who advise that you always move off-line — at least when presenting to the target — and I'm inclined to agree with them. However, with 19 others on the firing line any movement is dicey, even on the huge shooting bays you'll find at Front Sight. If you decide to incorporate this into your presentation, practice practice practice it beforehand. It's astonishing how even a little movement during presentation can throw off your aim during your presentation to the target. If you are dry practicing in an area with limited space, though, you can practice moving off-line during presentation, and then move back the opposite way during your after action drill (see below). Once the need for a weapon no longer exists, or when you're finished with a dry practice drill, you perform the Front Sight after-action drill. Gun to the ready position, move to a new location. In real life, the goals of moving after shooting are 1) to get off-line from where you just took your shots in case someone shoots back at that location; 2) get to concealment or cover. At Front Sight, movement in the after-action drill is to get you used to moving after shooting, as there isn’t much room to start with, and there is no concealment or cover close by. Look behind you on both sides, weapon pointing down range. Check your target for two seconds to ensure that he’s no longer a threat. Rotate your torso, shoulders, head, and gun together left and right of the target to check for additional threats. Tilt the muzzle up and check the slide of your gun to verify that it is in battery and ready for further action. Bring the gun back to the close-contact position, support hand on your torso. Bring your elbow up and rotate the gun down toward the holster. Safely, slowly holster your weapon. One technique Beneux did not teach us in this class (it might be taught in the advanced classes) is to pause at the close-contact position when holstering your weapon to take one last look around. A couple of us incorporated this into our re-holstering routine, though, without correction by the instructors. Beneux again emphasized the value of dry practice: Going through all the Front Sight procedures with an empty weapon while observing all safety practices, doing it slowly and perfectly. The goal is to be methodical. The speed will come later. Day one ends with a classroom lecture on the Moral and Ethical Decisions Associated with the Use of Deadly Force. This lecture is mandatory for first-time and CCW students. The lecturer's last name was Mayer. The basic message is that if it’s not worth dying for, it’s not worth shooting for. In general, “you are universally justified in the necessary use of deadly force when there is a reasonable fear of immediate, unavoidable death or serious bodily injury to an innocent person.” “Reasonable” means that someone else in your place would agree with your decision. This becomes important should there be legal action as a result of the shooting. The ability to harm an innocent person. The opportunity to cause harm. The intent to cause harm. I've sat through this lecture a couple times now, and each time I've wanted to stop Mayer and rake him over the coals. The first thing that rubs me the wrong way is that he sets up these scenarios that are somewhat unrealistic, and he presents them so vaguely that there is no correct response. I'm certain he does this on purpose, but what really bugs me is that he doesn't mention what should be the first option, which is to get out of the area instead of trying to be a hero. I also have an unresolved question that arises out of this lecture: What if there is no intent, but there is still imminent harm to you or others from the actions of another? Do you really let yourself and/or others be killed, maimed, or injured because the person committing the mayhem doesn't mean it? Oh, well — 45 minutes of irritation in four days of instruction is not bad. During the shooting portions of Day One, I had noticed that one of the other students had good form and was getting good hits on target. It was clear this wasn't his first time at Front Sight. Turned out he was a training officer in Minnesota, meaning that he was the person who trained the other officers in his department, set up the training scenarios, implemented all the safety protocols, etc. In short, he seemed the last person who would need Front Sight. So I asked him about it. It turned out this was his fourth trip to Front Sight. He loved it so much he did the full course, instead of doing just the advanced courses. His reason suprised me: Back home he didn't have anyone to critique him, so Front Sight was invaluable to him on that basis alone. Beneux started us off this morning with the tactical reload. The tactical reload is to be performed only when you have determined that your world is safe following your after-action drill. Check that you have another loaded magazine. While you are at Front Sight, this magazine should be in your magazine pouch. In fact, it should be the front-most magazine in your magazine pouch. Remove the magazine from the gun. Put that partial magazine in your pocket for now. Later, you can check the magazine in your pocket and, if warranted, return it to your magazine pouch. On the range, Front Sight discourages returning empty magazines to your magazine pouch, a wise practice in my humble opinion. Given the amount of shooting and reloading you'll be doing, I recommend five magazines, even if you're able to carry just four in your mag pouches. At Front Sight, you usually have a fair amount of time once your relay steps to the line to load, so you will be able to fish that first magazine out from a pocket, leaving all four mag pouches loaded and ready to go. If you have only four magazines, I recommend loading your gun from the farthest back mag pouch, so that when you are reloading under time pressure you still have mags in the nearest three pouches. Beneux also went more in-depth into the grip aspect of grip and stance. In gripping the gun, he taught us to apply isometric tension front-to-back — don’t squeeze the sides of the gun. This tension helps control recoil, and because you don’t have a death grip on the gun, you are better able to align the sights on your target. Next up were jams and malfunctions. A jam is a mechanical failure that requires a gunsmith. A malfunction is something you can clear relatively quickly to get back into the fight. Front Sight teaches you to identify the symptoms of the various malfunctions, and then apply the appropriate solution. Check for magazine — you have none. Look at the slide and move. Get your thumb on the magazine release button and get a new magazine. Once you know you have another magazine, release the empty magazine. Insert new magazine, and release the slide. Drop partially-depleted magazine and insert a fresh one. Begins and ends with a chamber check / magazine check. Follows the pattern of the tactical reload. Front Sight teaches malfunction and reloading drills in such a way as to separate them from the decision to shoot. This is to help avoid situations where there is no need to shoot, but you complete your malfunction drill with a step that includes re-engaging your target. Under stress, you may intellectually understand that there is no need to shoot, but your muscle memory could cause you to shoot anyway if that’s what you trained to do. In a gun fight, Plan A is two shots (a controlled pair) to the chest (thoracic cavity). If Plan A doesn’t work, Plan B is a head shot. If Plan B doesn’t work, there is no Plan C. Keep employing Plan B until it works. The alternative is that you are dead. Give a brief overview of why you’re calling. Remember that everything you say may be used against you at some point. Ask them to send police and an ambulance. Tell them you want to press charges. When the police show up, find out if you’re going to jail, or might be released. This might require asking the person questioning you if he has the authority to make this determination, and if not, speaking with the person who does have that authority. In any event, stick to the simple facts of the case, and ask to go home as soon as you have given your basic statement. As you can tell, Front Sight's recommendations for dealing with authorities is more nuanced than that from the "five words" crowd ("I have nothing to say. "), but might help you avoid an overnight stay in jail. Another alternative is to be as cooperative as possible while sharing as little information as possible, and if the questions start going in a direction that seem not to be in your favor, telling them that you really, really want to cooperate fully, but that the questions are making your uncomfortable and that you need to speak with an attorney before you say anything more. According to Front Sight, compared with dealing with the criminal authorities, the civil case is almost always a lot more scary, involved, and potentially expensive. This is why there are resources such as CCW Safe. If memory serves, today saw a student drop out from dehydration, despite the mild weather conditions and the copious amounts of water provided by Front Sight. Fortunately, she was able (narrowly) to avoid a trip to the hospital after she returned to her hotel room, but she was unable to continue training. Stay hydrated! Back on the range for the afternoon, you start off with designated head shot, which is the shot you must take when your opponent's torso is armored, covered, or behind a cover or a hostage. Beneux also revealed that the reason for the emphasis on a well-drilled presentation to the ready is that getting your weapon out of the holster as quickly as possible, tells your opponent that you are familiar with your weapon, if nothing else. Beneux also informed us that end-of-the-course evaluation includes malfunction drills for time and correctness. Therefore, we dry practiced malfunction drills. We were told to bring a concealment garment for class the next day, which is one of the biggest reasons to take the four-day course as opposed to the two-day course, as there is no presentation from concealment in the two-day course. Tactical movement involves activities such as clearing a house. First rule: Don’t do it if you don’t have to. If they’re after your TV, let them get it. If a family member is in jeopardy, then you have to respond. It’s one of the most dangerous things you will ever do. Tactics don’t guarantee success — You still need to execute your shots. Keep the element of surprise. If you try to use OODA, it takes away too much of your time. OODA = Observe, Orient, Decide, Act. Make use of cover and concealment. Play the angles / slice the pie when going through doorways and other choke points. Pace of movement. Individual action is slow, for safety. Only move as fast as you can guarantee good hits. Maximize your distance. Distance favors the trained shooter. Front Sight teaches students to walk normally most of the time, forward and backward. No fancy walks or footwork, with the exception of when you are forced to clear corner or a room visually before proceeding. To clear a corner, Front Sight teaches you to stand back as far as possible to avoid getting by a ricochet (this is especially true when your opponent is using a shotgun). Take small steps. Scan vertically as well as horizontally. When making small movements, step with your front foot and then trail with your other foot, keeping your balance at all times. Once the corner is clear, go back to regular walk. If it’s not clear, inspect and identify. Make certain of your target before shooting. When going around an off-hand corner, use your strong hand. The Front Sight technique for going through a doorway eliminates or minimizes almost all of the danger points in this extremely dangerous maneuver. Stand off to side of the door, not directly in front. Approach from the door-knob side. Get all the information you can about the door, hinges, closers, etc., before committing to going through. Look for light, listen for noises beyond the door. Approach at a 45 degree angle to give yourself room, while maintaining cover. Hold your gun close-in at position 3, pointed high enough that you don't cover your hand while you reach for the door knob. Turn door knob all the way, slowly and silently. Throw open the door and step back a couple feet at a 45 degree angle. Take your ready position, preferably using the cover of the wall. Inspect what you can now see. Few persons can hide along an eight-foot wall when you’re looking through the door situated along that same wall. Check the room for adversaries bit by bit, carving off tiny angles so you don't expose yourself. Step-and-trail to maintain your balance, and don't forget to scan the room vertically as well as horizontally. Do complete scan from side to side. Once you've determined that it is safe to cross the threshold, do so quickly. Go all the way to the other wall / side of the door — don’t pause in the doorway. Do not remain in the "fatal funnel" any longer than necessary. As you breech the face of the door, extend your arms / gun and walk through looking for targets. After this section of the course, you'll never look at a cop TV show the same again. The way they go through doors may be great for keeping the pace of the show up and leaving room for commercials, but it's also a great way to lose your weapon or worse. After two days of near-perfect weather, there was a bit of a breeze on day three. Fortunately, it came from directly behind the shooters on the line. Day Three starts off with the basics of concealed carry, stressing that you must find a balance between concealment and accessibility. Concealment means concealment: You must keep the gun covered. Grab the front of the garment and sweep it back out of the way. Drop your strong hand down onto your gun, and proceed with the standard presentation. Some people recommend putting a small weight in the bottom corner of your conceal garment so that when you sweep it out of the way, it develops some inertia and stays out of your way while you complete the presentation, as does Front Sight. Either sweep the garment out of the way with your support hand; or use the “hitchhiker’s thumb” to lift the hem. Index and remove the magazine as normal. Grab the front of the garment on the strong side with your support hand. Force the garment back under the armpit on your strong side. Trap the front of the garment with your upper arm on your strong side. Reholster as normal from Count 3. Reach across your body with your support hand. Grab the hem of your conceal garment near where your gun is. Pull the hem up and across your body to ensure that it clears your gun. Present as normal: Your support hand should already be against your torso, ready for Count 3. Reverse the procedure to reholster. No matter how you carry, dry practice from concealment. Present faster: Really give your torso a hard slap with your support hand; your strong hand will then try to keep up. Flash sighting: If you are at seven yards or closer to your target, pull the trigger as soon as you see the front sight is on your target, regardless of the sight alignment. Compress your trigger pull: Combine the take-up of the slack and actual trigger pull into one smooth, fast movement. These weren't just gratuitous suggestions, as the end-of-course skills drill would be timed, making it critical to eliminate wasted movement and maximize efficiency. I only caught the first half of this lecture because I needed to make a couple calls, which was disturbing because the lecturer really seemed to know his stuff. I wish I'd be able to stay for the entire lecture. Next time, I'm staying for the whole thing and I'm taking notes. Actually, that brings up another pointer: Consider taking notes during the lectures. Lectures are much more time-constrained than range activities, and if you think you'll just wander up after the lecture and ask a few questions you're likely to be disappointed because there will be lots of competition for the lecturer's time. You almost certainly better off button-holing the lecturer between other activities, as most of them seem to be on-site all day. At any rate, don't expect to have a lot of time to chat with the lecturers. Chuck Taylor emphasized the problem of the "fatal funnel" more than Front Sight does. The "fatal funnel" occurs because for the perp in the room, you can only be coming through the doorway, which is easy to cover, and blanket with fire if necessary. For you entering the "fatal funnel," your adversary could be anywhere, placing you at an extreme disadvantage if you haven't cleared the room properly beforehand. Front Sight also doesn't advise you whether to talk to adversaries or potential adversaries while clearing an area. Some students chose to call out, or to advise non-combatants out loud to leave the house and call 911. I chose not to, the thinking being that if there are other bad guys and all they hear is me shooting their buddies, there will be at least a little confusion as to who just shot whom, which might give me a tactical advantage. Next, Beneux introduced us to the ragged hole drill, a drill he uses personally to start and end each of his range sessions. From whatever distance works for you (typically three to seven yards, depending on your skill level), you fire five shots at a one-inch square target, trying to place all five shots close enough that they touch (hence, the ragged hole). After that, you repeat the same procedure, only with dry practice. Then you finish up with another five live rounds. It's astonishing how much better you shoot the final five compared to the first five, thanks to the dry practice. The four one-inch targets appear on each Front Sight target just for this drill. Knowing that I'd be tested on malfunction drills in less than 24 hours, I went back to the cottage and repeated each drill in hopes I'd remember all the steps in the correct order, and do them quickly enough to avoid embarrassment, if not the time limit. Still petrified about the malfunction drills test later in the day, I arrived early and practiced some more, not very encouraged that I was already mangling the order of steps to clear the Type 3 malfunction. This is definitely a candidate for dry practice. Day Four brought a bit stronger winds than Day Three, but still from directly behind, so the only real issue was for people with a light open-front concealment garment, which wanted to blow closed the moment the student thought he had swept it out of the way. As with the previous three days, though, the temperature was just about perfect. Day four teaches you to engage multiple targets. In addition to your other training, Front Sight teaches you to move to a position where you can engage all the bad guys on your terms, the way you want to. Front Sight also teaches students to observe boarding house rules: Everyone gets one round before anyone gets a second. Front Sight did not explicitly teach us to engage the nearest target(s) first, or the most dangerous target(s) first, but perhaps that type of target evaluation comes with the advanced courses. To engage the targets more quickly, Front Sight teaches students to move to shoot the next target during the recoil phase, resetting the trigger along the way. In your after-action drill, Front Sight teaches you to check your targets in the order you engaged them. After this comes a head-to-head competition in the form of a hostage drill with red, white, and blue targets. The red target is hiding behind a steel "hostage," so must take a head shot. Also, you must make your head shot (AKA "designated head shot") before engaging the two more distant steel targets. Whoever is faster without hitting the hostage moves on. The other one sits down. I got a comeuppance on this drill, as I had been shooting well all day and rushed my designated head shot. Unfortunately, I not only hit the hostage, but in so doing moved the target in such a way that I thought I'd made my head shot. It probably took me two seconds to figure out what had really happened, and another couple seconds to reacquire and hit the target. If I hadn't been disqualified for hitting the hostage, I would have been out on time. After lunch Beneux had us revisit the ragged hole drill, after which we took the skills test, which in addition to the dreaded malfunction drills includes shooting at various distances with various scenarios. After my attack of hubris during the head-to-head competition, I really attempted to focus on what I'd learned during the four days, and employ it as best I could in the allotted time. Here for me, the dry practice paid off, as for the first time ever I nailed each of the malfunction drills, performing each of them correctly in its allotted time. After the skills test we took our seats for the last time as Beneux handed out course certificates and awards. I think he was as amazed as I was, that I'd earned the "DG" award, which in my case should stand for "Dangerous Grasshopper," but which at Front Sight stands for "Distinguished Graduate." In my experience, the typical class at Front Sight has close to 40 students, with some who have never handled a gun before (check the videos on the page), some who have been through the class one or more times before (and maybe carry a gun in their line of work), and everything in between. If you have a bit of experience handling your weapon, you may convince yourself that during the first day and a half when most of the drills are done at the pace of the instructor’s commands, that you don’t need to pay attention to every little thing the instructor says. This is a big mistake. The instructor’s commands are part of the repetition process by which you learn the Front Sight method. It must be gruelingly tedious for the instructors to have to issue each command hundreds of times over the course of the class, but what a gift it is to the student who listens. To give just one example, when you bring your weapon up to shoot, the natural inclination is to focus on your target. Good shooters know that this is exactly wrong, as you want to focus on your front sight (hence the name, “Front Sight”). Under stress, studies show that you'll lose half of the skills you acquire through drills. If you should ever need to use a weapon to defend yourself or others, you'd better hope that you hear your instructor’s voice in the back of your mind saying, “Hard focus on the front sight!” After having heard it hundreds of times, and — hopefully — having practiced it, you might actually be able to execute it when it really counts in a life-or-death situation. If you're like me, you may feel that waiting to follow the range commands means you're not getting to shoot as much as you could if you just sped everything up right away. Don’t worry. In the four-day course, you'll do plenty of shooting, and there will be plenty of time to do it, if for no other reason than even if you finish right away, you still have to wait for the rest of the line to finish before moving to the next action. You might as well focus on each range command, and master every step as you go, so that as the instructor picks up the pace, you've mastered the steps themselves. 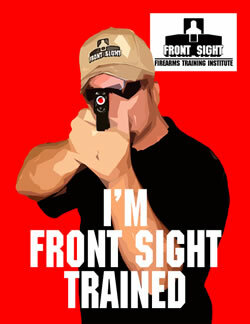 If you think you'd like to attend Front Sight for any of its training programs, there are two ways of doing so. First, you can attend classes ala carte, paying for each class as you go. This may seem the fiscally-prudent approach, but it can actually be more expensive. The other way is to purchase a lifetime Front Sight membership (such as its premium Ambassador membership), which allows you to attend any course any time at any Front Sight facility. The "retail" price of this membership is $25,000, and if you've got that kind of dough I'll bet Front Sight would love to hear from you. However, you sometimes can find these memberships at a discount: Either people have purchased more than they need, or are transferring an existing membership, and the price will be far less. Just be aware that sometimes these "second-hand" memberships require a transfer fee atop the purchase price. I try to keep tabs on the market for discounted memberships, so if you're interested, I usually know of a source for Ambassador memberships for less than the price of the base model Apple iPhone 5©, with no transfer or monthly fees. If you've been paying attention (which is not a given, considering how lengthy this review has become! ), you'll note that this is a great deal even if you plan to attend Front Sight only once in your life. Of course, if you do attend once and then decide never to go back, you can resell or gift your membership so someone else can enjoy it. Contact me if you are interested. After graduation as a reward, I went to Mom's Diner in Pahrump and had a great meal. They really are the place to go in Pahrump. The interesting thing for me was that there were a bunch of other Front Sight students there at the time, and many were openly carrying a weapon. For me, having been at Front Sight with nothing but weapons as far as the eye could see, it seemed normal (plus, I recognized them as having been in one of the other classes). Looking back, though, it's weird in a wonderful way to have experienced that. Kudos to Mom's Diner, not only for the great food, but also for supporting our 2nd Amendment rights. After returning home, I told a couple buddies that I'd just been to Front Sight. One of my buddies immediately responded, "My friend Paul Smith [not his real name] goes to Front Sight all the time, and the last time he was there he shot himself in the leg." "What happened," I asked. "He was reholstering when one of the instructors grabbed his arm and the gun went off." Without questioning that my buddy's friend did actually shoot himself while at Front Sight, I have to say that I don't believe the version of the story as told to me. First, Front Sight relentlessly reminds you to reholster slowly and safely. If "Paul Smith" had been following instructions — that is, reholstering slowly and safely — there is no way he could have shot himself no matter what someone else did. Second, Front Sight instructors don't grab you, period. The most I've ever seen them do (and this is even taught to students so they can be better relay partners) is to block the shoulder from turning so shooters on the line don't muzzle others, or block the strong side elbow to prevent the gun from coming too far back and muzzling those behind the shooting line. I can, however, understand how somebody might negligently shoot himself and then try to blame it on someone else. Finally, with the training officer's story in mind, I approached law enforcement representatives in my area, in hopes that I could donate some Front Sight memberships to them. Unfortunately, they are prohibited from accepting personal donations in excess of a certain amount, and Ambassador memberships seem to be way above the upper limit. I'm still working on this one.